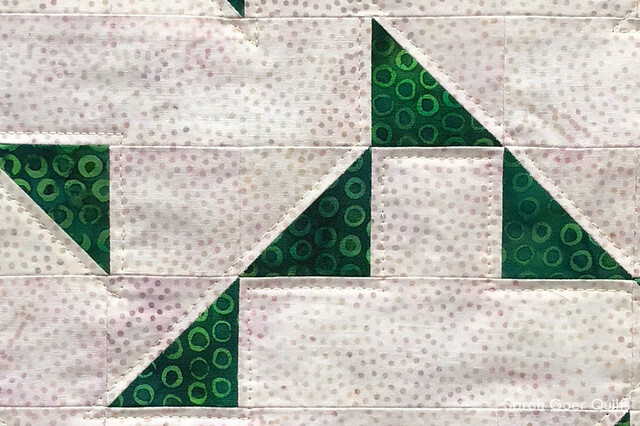 Last month I created Emerald Swallowtail, a baby quilt designed with inspiration from a vintage quilt design. 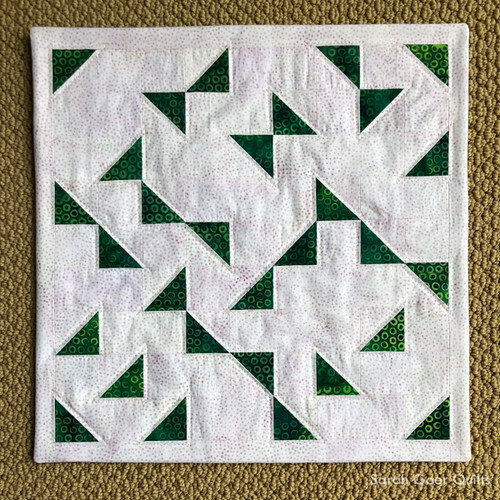 The creation of that quilt resulted in 30 leftover HSTs from the offcuts of my snowball corners. 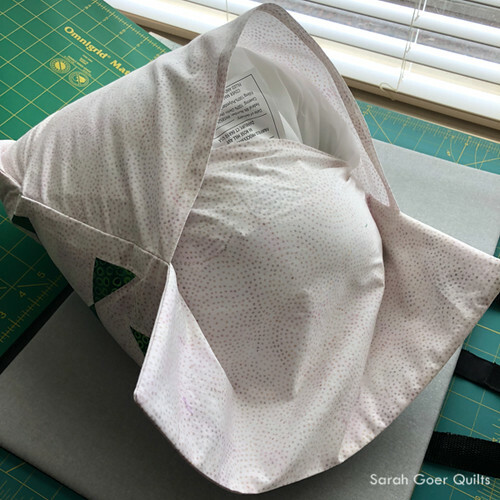 Step 4 of this tutorial shows how I like to sew a second line of stitching before cutting off extra triangles. 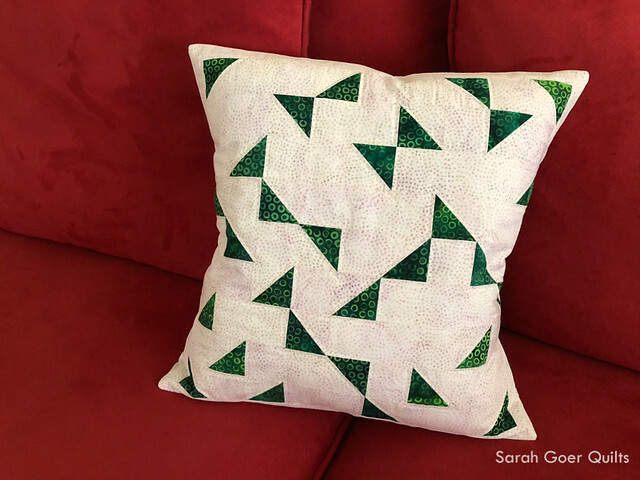 I prefer to have leftover HSTs instead of just a pile of loose triangles that I'd have to sew bias edges together later to use. I have a bin where I keep orphan bits and blocks that these usually go into. I've used them previously to make mini quilts and small bags. My emerald HSTs didn't even make it into the bin though. I kept them out to use for this months Playful Pillow! I decided I wanted to make something with the same limited palette as Emerald Swallowtail. 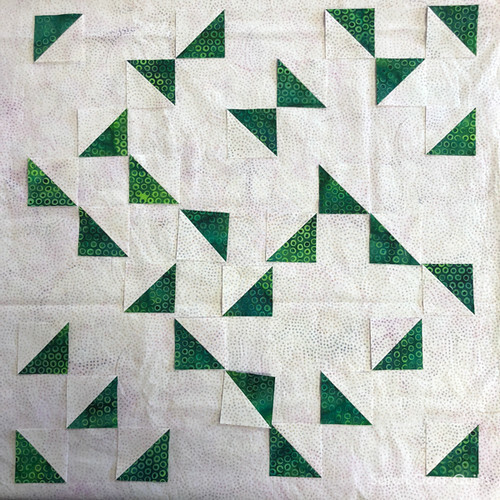 I had used all of the green for the quilt (Bubble Hole in Leaf), but I did have yardage left of my neutral (Almond). Designing without a pattern I used a Planned Improv technique to limit myself to the HSTs and Almond yardage for the pillow. I designed on a grid, and decided that triangles could only touch on a point, not on a side. Here's the final plan. My HSTs were trimmed to 2" x 2". Once they were pieced with filler pieces cut from the background yardage I had a 14" x 14" (unfinished) panel. I added borders to each side, intending to trim down after quilting. I opted for Hobbs polyester Thermore batting. It is ultra-thin (1/16" loft) and I figured it would be nice for the pillow cover to not get crinkly in the wash. Here's a peak of the Thermore batting layered over my quilt top. I added a backing layer of fabric for my quilt top before adding some walking foot quilting. I opted to echo each group of triangles approximately 1/8" off the perimeter using 50wt Aurifil #2110, Light Lemon. I'm happy with the look of this. 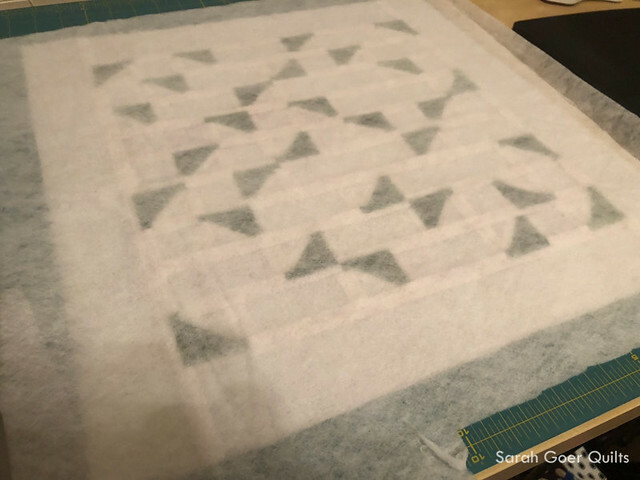 Another option would be to add filler quilting in the background, or to add quilting inside and outside of these echo lines. My finished pillow cover is 15" x 15". And here it is with a 16" Poly-fil pillow form. This is the first pillow cover I've made, and I opted for a snug fit. I'm curious how the look would change with a down pillow form. How do you like to finish you pillow covers? 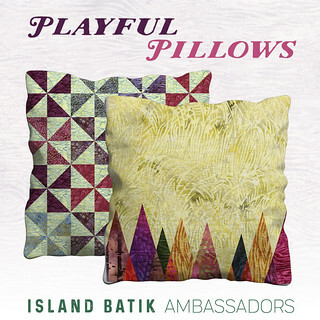 Thank you for visiting to see my Island Batik Playful Pillow! I've linked up to TGIFF, Finish It Friday, and Needle & Thread Thursday. Posted in Quilting. Tags: Island Batik, Island Batik Ambassador, pillow, planned improv on May 31, 2018 by sarah. Beautiful pillow Sarah and I usually make my overlap extra long too. The pillow is a fantastic companion to your previous project. Wrestling in the pillow forms is always a bit of a workout and a lesson in perseverance. I'm glad you like my tip, Lindsay. Thank you for visiting. Cute pillow, you can use it anywhere. Thank you. 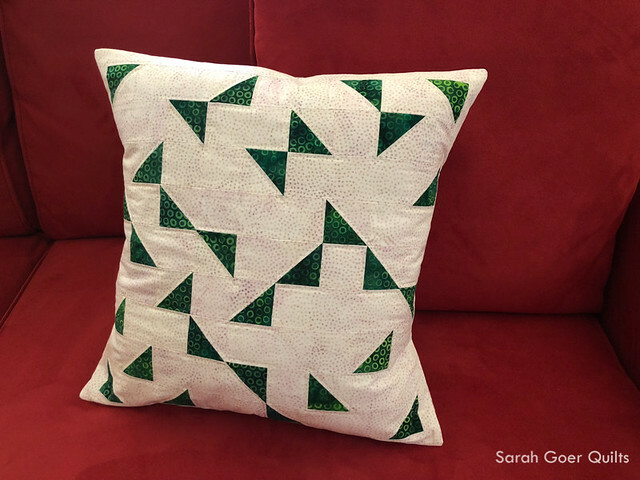 I think a pillow is a a nice sized project, and a versatile gift. Great way to use leftover HSTs. I do an envelope closure or hidden zipper...depends on who the recipient is and if I have a zipper handy. Thank you, Anja. I've never installed an invisible zipper. I should try that out! I like an envelope back also. I had the same problem making too much overlap on a pillow. I'm never sure what's best: if both backing pieces should be the same size or if one should be shorter than the other. I think if both pieces are the same size and there is a big overlap, it's much harder to get the pillow inside. Thanks for giving me something else to consider. I'm not sure why I didn't think about the flaps being different sizes. Lovely pillow! 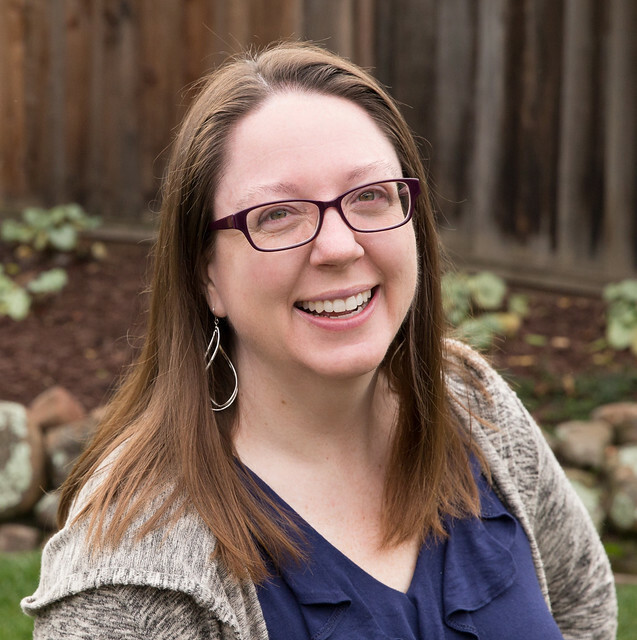 Thanks for linking up on behalf of the 2018 global Finish-A-Long hosts. Thank you, Sandra. Thanks for hosting!